I’ve carried this scrap of paper in my wallet for countless years. Whenever I have a quiet moment I take it out and look at it. I perfectly know what it says. But I just need to see it in writing. 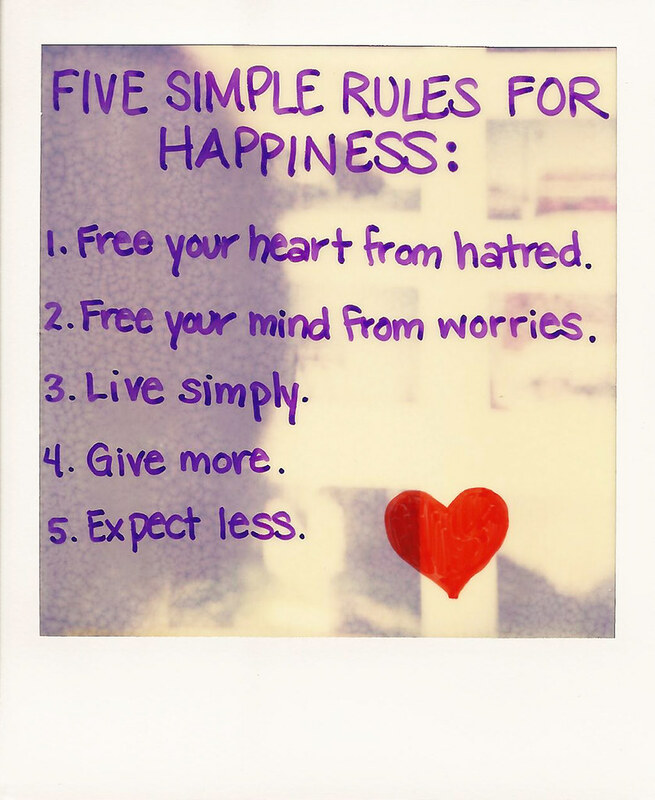 Written on it are the 5 simple rules for happiness. This tiny piece of paper helped me through many downs, and kept me grounded through ups. But now it doesn’t seem to work anymore. It’s broken, somehow. Did that already happen to you? You carry a quote, a saying, anything, refer to it for years, and suddenly it seems flawed? I’m in trouble because of #4 and #5. Giving is a wonderful concept – but it’s not everything. At one point you need to think of a healthy amount of “taking”. Sometimes it seems that in this world everyone has become a “taker”. But for some people, unexpectedly, taking is really hard. When I started teaching yoga I always wanted to give more. I didn’t sell myself really well. What I charged per session (including preparation time, minus public transport) worked out as below minimum wage. I loved teaching so I kept going. Until I was so worn out that I stopped. I stopped because I was depleted, but also too afraid to charge more (much, much later I did – but that’s another story). I wanted to Give More. But the rule just didn’t serve me well over time. It took a long time until I understood that you can only give energy if there’s some left for you in the end. I understood this about money (you can only spend what you have) but not about energy and other non-material “things”. I was also expecting less. It’s easy. You won’t be disappointed. Disappointment makes unhappy, and if you avoid that, well, your chances of being happy are higher, right? However, I believe in many circumstances we need to expect more. We need to expect being treated fairly. The food to contain what it says on the label. Being safe when walking in the street at night. Being treated with consideration when ill. The government to implement the will of the people. True, if we don’t expect anything, and then we don’t get anything, we’ll still be okay. We didn’t expect anything after all, right? So everything is fine? But what if we keep lowering our expectations until we hit rock bottom? I believe it’s totally fine to expect certain things (and to assume that others expect the same of us). And if things don’t turn out the way we were hoping for, I believe we can (should?) learn how to live with disappointment, and how to use disappointment as a catalyst for change. Is constantly expecting less not just the armour that shields us from any kind of disappointment? Image credit here and here. Thank you for this. I, also, often find myself depleted to the point where there is nothing left. At the very beginning of learning how to take care of myself. Just taking baby steps. Starting a blog is a way to help me process all the swirling thoughts. Again thank you. It helps not to feel alone. Very well written post, good job. However it seems a bit limited and much easier said than done. On the point of expecting less; I think it’s part of life to be dissapointed and upset if we don’t get certain things or reactions from others. There’s a lot we can learn from these moments. Very well written post, good job. However it seems a bit limited and much easier said than done. A little corny but that’s not your fault. For me, I need to listen to myself and what I need. Over the years I’ve learned how to deal with certain feelings of mine and what I need to do to help myself and maintain my happiness. This is such a great post, and I’m with you 100%! I guess there’s a fine line we need to balance on for things to not tip over one way or the other. I used to be like you, giving a little bit too much until it hit me hard, and now I believe I’ve managed to find a good balance between giving and taking. I probably still expect too much in most situation, but I don’t mind that so much. I just expect a lot out of life in general, because it is so beautiful and full of surprises! And as you say, we learn a lot that way too, and disappointment is a great teacher. I think the wisdom contained in these words is entirely up to the individual and the context of your life. In my case, I do a very good job of taking care of myself – I’m selfish, perhaps because I have to be; otherwise I lose myself very quickly. So I do need to give more. And I have great difficulty lowering my expectations, which means I’m often disappointed – a recipe for unhappiness. Yes, so true: “more” or “less” is always relative… Thanks for sharing your thoughts!